A Royal Naval rating in 1A uniform (a modern sailor suit). In the Royal Navy, the sailor suit, also called naval rig, is known as Number One dress and is worn by able rates and leading hands. It is primarily ceremonial, although it dates from the old working rigs of Royal Navy sailors which has changed continuously since its first introduction in 1857. Versions have been adopted by many navies from around the world. The flap collar is perhaps the most recognizable item of the sailor suit. It is often considered lucky to touch a sailor's collar. The bell-bottomed trousers were designed so that they could be rolled up easily when scrubbing the decks. 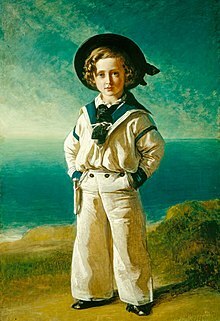 In 1846, the four-year-old Albert Edward, Prince of Wales was given a scaled-down version of the uniform worn by ratings on the Royal Yacht. He wore his miniature sailor suit during a cruise off the Channel Islands that September, delighting his mother and the public. Popular engravings, including the famous portrait done by Winterhalter, spread the idea, and by the 1870s, the sailor suit had become normal dress for both boys and girls all over the world. Some Western cartoon and comic characters use a sailor suit as their trademarks; examples include Popeye and Donald Duck. Sailor suits have been worn by the members of the Vienna Boys' Choir on their international tours. A female version of the sailor suit, the sailor dress, was popularly known in early 20th century America as a Peter Thomson dress in the early 20th century after a naval tailor with outlets in New York and Philadelphia. Many schools in some Asian countries, including Japan, the Philippines, Taiwan, North Korea, South Korea, Hong Kong, Singapore and Thailand, have adopted sailor outfits as a school uniform. Sailor suits are especially common in Japanese girls' schools, known as sailor fuku by the Japanese. They are so common that the image of the outfit has evolved to be strongly associated with youth and female adolescence in popular culture. As a result, sailor uniforms are seen very frequently in Japanese dramas, movies, anime, manga, music videos and concert performances of pop teen idol groups. ^ "British Empire: Glossary: R". ^ "anime uniform same as your school uniform". Crunchyroll. Retrieved 2018-05-14. 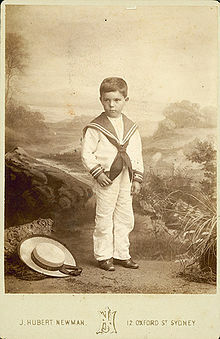 Wikimedia Commons has media related to Sailor suits. This page was last edited on 5 February 2019, at 23:36 (UTC).